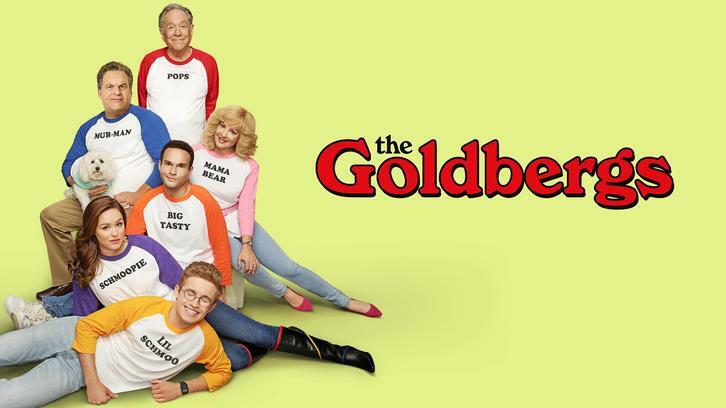 The Goldbergs kicked off the post-Lainey era last week and also said farewell to another beloved character; Coach Mellor. His departure shouldn't have really come as a shock, given Bryan Callen is a series regular on Schooled along with AJ Michalka, but I guess with all of the build-up focusing on Lainey and how she'd be parted from Barry, his exit didn't cross my mind. She may not have officially been a Goldberg but Lainey is still very much loved by the audience and characters, and therefore it wasn't a surprise to see Bill, Erica and Barry taken her departure so hard given they had all lost a daughter, best friend and fiance. They were in a massive rut of depression which was nfortunately keeping them cooped up in the living room, which we all know is Murray's designated zone. Being the loveable smother that she is, Beverly attempted to make things better by trying to soak in all of their pain and anguish but unintentionally made things worse and was soon joining them on the sofa of depression. Taking desperate actions, Murray deduced that the best way to make people stop feeling sad was to give them something nice, shiny and happy to distract them. So the Goldbergs and Bill took off in the car to attend a sports game and Murray put on the happiest song ever; The Pina Colada song. I'm very much a person who knows what it's like to hear a song play so much that you go from hating it, to loving it, back to hating it, putting up with it, falling in love all over again and then wanting to throw the player out the window. The Goldbergs and Bill went through all of these emotions in a matter of minutes courtesy of breaking the player. For all his troubles of trying to help his family, Murray ended up being pulled over and getting a ticket for ironically trying to drive through the breakdown lane. It was there when they all questioned why he couldn't just let them be sad that Murray admitted his own sadness at Lainey being gone. It is sometimes easy to forget with her being Barry's fiance and Erica's best friend, she had indeed grown up around the Goldbergs so would of course be close to Murray and Beverly and they too would share their children's sadness over her depature. Given Murray does tend to be closed off emotionally, preferring to take a step back whilst Beverly throws herself into situations, his state of mind isn't something that is ever really explored but admitting that he was trying to be the strong one because someone had to? That's a moment I'm sure everyone can relate to. Returning home, Murray joined his family in being miserable but having heard the song so many times, it was now fully ingrained in their heads and the Goldbergs couldn't resist an impromptu singalong that managed to break Murray. Soon the family were edging away from the cliff and into the post-Lainey world. It won't of course be easy for them, but they are over the first hurdle and it can only be up from here. Away from all of this Adam was off in his own plot this week which revolved around gym. He once again managed to get a note from Beverly that stopped him having to take part in a mandatory gym excercise, and it looked like all of his and the other less athletic boys prayers had been answered when Coach revealed he was leaving. Unfortunately his replacements weren't exactly desirable but all hope was not lost; Coach does of course have a brother and he was more than happy to step into the chair. That's not something Adam was too keen on and he was still trying to get out of the gym excercise when Coach showed him clips of a famous woman who had managed to cheat her way through the marathon, with everyone being so impressed by a woman of low fitness being able to win, no-one ever stopped to consider how she'd done it. Wrongly taking inspiration from this, Adam decided his best way of getting through the gym excercise was to have Pops drive and Adam get out of the car to walk at different stages. He was soon joined by the rest of his friends in this practise, and they were met by Coach at the finish line, who was extremely dissapointed that in all his years of teaching? The only thing Adam had taken away from his lessons was how to cheat and be dishonest instead of giving it his best shot. Comprehending his actions, Adam and the rest of the gang did indeed complete the gym excercise. They were horrible, but that's not what mattered and Coach was able to walk away from the school with his head held high, knowing there was still some hope left for the younger generation not blessed with athletic skills.